So, we just got back from taking our girls to their first trip ever to Disneyland in California. 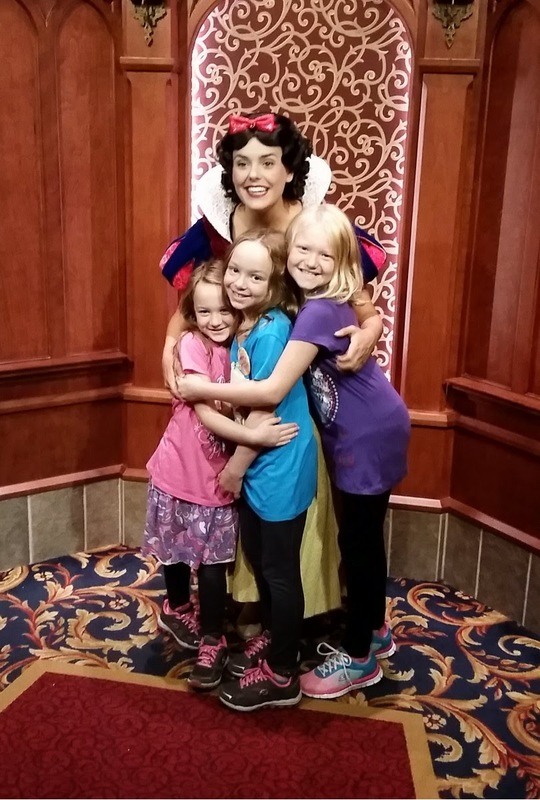 We had a four-day park hopper pass, and spent some (okay, a lot) of our time each day tracking down those must-see princesses so we could have our picture taken with them. 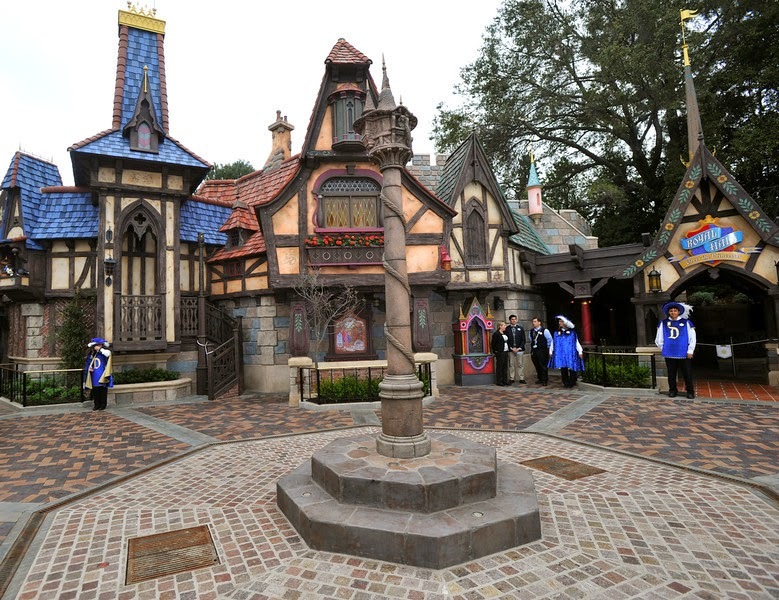 Disney has come up with a new location to meet princesses, and it's called Fantasy Faire. If you head up towards sleeping beauty's castle and swing a left right before you get there, you will find a quaint little provincial village chock-full of adorable princesses on their home turf. There is a little town square, and a covered stage area - The Royal Theater - (more on that later) where you can see small theatrical shows featuring Belle and Rapunzel. There is a few snack carts around, and a princess dress and accessories shop (but of course), and there is also a castle-like structure - The Royal Hall - where you can go inside and meet up to three princesses at once! The adorable little town square, and the entrance to the Royal Hall is over on the right of this picture. Cinderella and Snow White are the mainstays here, and then there is a third "mystery" guest, which can be any princess. The entire time we were there, the third princess was Ariel. If you head towards fantasy land first thing in the morning (on a non-early magic morning day) there will hardly be any line to see these princesses. You walk in one family at a time, and we came around the corner and there was Ariel, in all her red-headed glory and blue sparkling gown, and in her own royal receiving room to boot. My girls were stunned. She twirled her hair and had all the Ariel mannerisms down pat. My girls were so quiet she even asked them if Ursula has stolen their voices. If it is your first visit, or your birthday, you can get a "1st time" or "birthday" button at any information booth outside the park. If the characters see that, they will make a big deal about it being your first time. She asked where they came from, and then Ariel immediately asked them if they were mermaids that swam down from Washington. Here she is pondering if they are mermaids. Around the next corner was Cinderella. She was very sweet and my girls were still in shock they were meeting actual, real, live princesses. Around the third corner was our final princess, Snow White. She freaked us out a bit because she talked in a high-pitched voice just like her character in the movie. She was nice though and they did move in for a little chat and a hug. 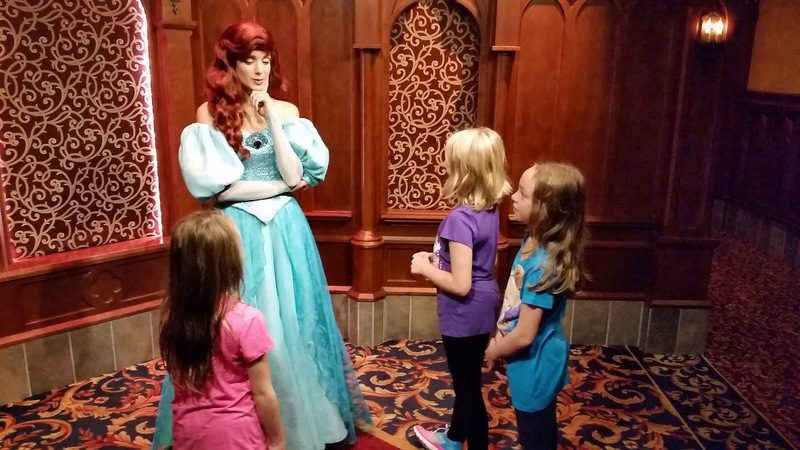 Matter of fact, all the princesses took time to talk with the girls, asked where they were from, and tried to interact with them on a personal level, and talk about things from their movie. I was surprised they took a minute or two to ask questions and not just rush into a pictured pose. We were pretty pleased we had met three princesses right off the bat, FOR FREE, with no waiting, and not to mention they were kind of the big "three". Do be advised that as the day goes on, the park gets more crowded, and the line on one of the days to meet them was 35-40 minutes long. Try to hit the Royal Hall when the lines are short. Other places we saw Cinderella and Snow White were out front near the entrance gates one morning. Outside the Royal Hall, under a little umbrella, you can meet a few other princesses, depending on the time of day. Most often for us it was Merida. Both my husband and I cracked up at how true to the movie personality these characters stay. 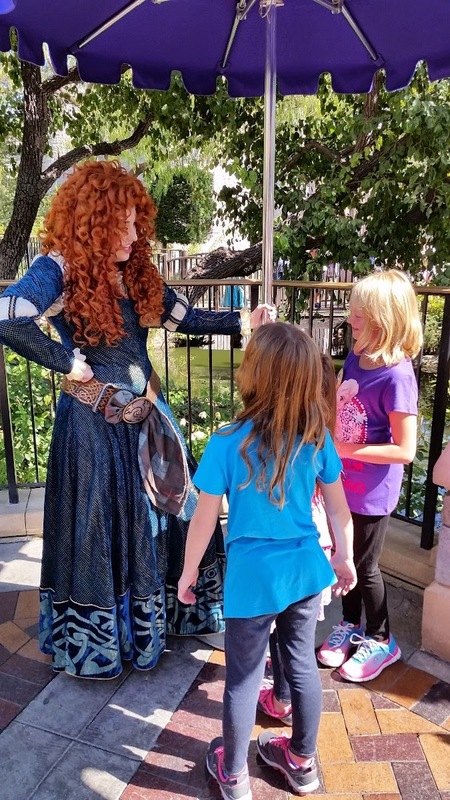 Merida in "Brave" is a rambunctious teenager, so when she came out to meet us, she was twirling and striding around without a care in the world. A small to medium long line would form around the iron fence heading toward the moat around the castle. If you stand in line and it was time for the character to take a break (they take breaks often), they would switch her out with another princess, so you were not waiting in line in vain. Luckily we made it through the line and Merida was still there. If Merida had to leave, out would come Rapunzel (or Belle). The times of when and WHO is under the shade umbrella, is based mostly on who is going to be doing the stage show in the Royal Theater that day. Times are posted right outside the Royal Theater, and for us, Belle had shows in the morning time slots (about once an hour) and Rapunzel had the afternoon shows. If Belle had the morning shows, she would not be out under the umbrella until the afternoon. Rapunzel was out in the morning because her shows were scheduled in the afternoon. Check the times of the shows to guess who is out under the umbrella. They use Merida as a fill in because she does not have a current show running. The Royal Theater is a comfy, shady spot where kids sit on carpets near the stage and grown ups sit on wooden benches. The show is hilarious and even the adults were getting into it by shouting "Huzzah" at the heroes and yelling "Fie" while shaking their fists at the villains. Here's another trick: After watching either the Belle or the Rapunzel show in the Royal Theater - WAIT until the show is completely over but DO NOT EXIT THE THEATER. If you wait a few minutes the star of the show (Belle, or Rapunzel and Flynn Ryder) will come back out and take pictures/sign autographs. Here we are meeting Belle after the show. Most people leave the theater because they do not know this little tidbit, so the few smart ones that stay get to meet them in person. It is not a guarantee they will come back out. I was told by a cast member that the first two shows of the day for each character are the most likely for them to come back out for pictures. We choose a different day to see the second show, and finally got to meet Rapunzel and Flynn Rider when it was over. Flynn Rider was a crack up by the way. After we snapped this first picture, I said give me some smoulder Flynn Rider, and he lowered his head for a few moments, just like in the movie, then whipped his head up slowly with the raised eyebrow and everything. 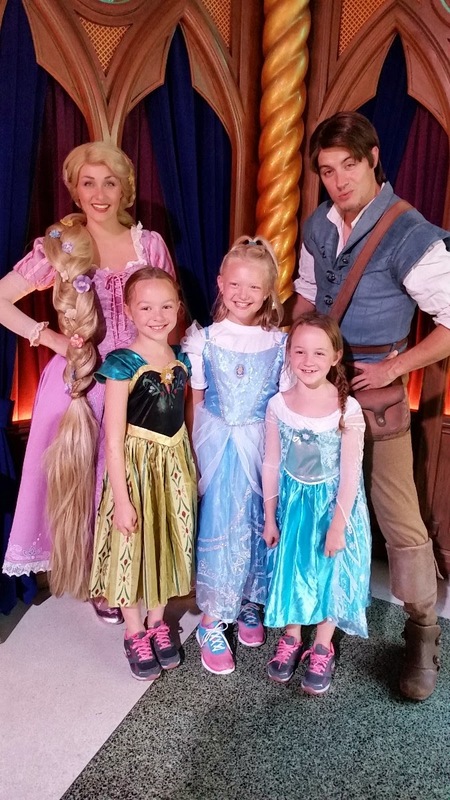 So there we had met three MORE princesses PLUS Flynn Rider all in one place, and we got to watch a very cute (might I add very funny) show that even the adults were cracking up at, all under a shaded tent with comfy benches. These two are currently the most desired princesses at the park. I am told only a few months ago, people would stand in line for 3 or 4 hours just to meet them. Disney has come up with sort of a "fast pass" system, so you don't have to spend your entire day waiting in line. Because of their popularity, you need a ticket to see Elsa and Anna! The tickets "sell" out fast too. Early in the morning, as soon as the park opens, head through Sleeping Beauty's castle an swing a left at the King Arther Carousel. There you will see a few snow covered chalets, and a smattering of maroon umbrellas out front. Near the 2nd umbrella you will see cast member handing out tickets for you to return later in the day. There might already be a long line waiting there as you round the corner. People make a bee-line for this area. The first day we went, the line wasn't that bad and we got tickets for 3:30pm later that afternoon. The second time was a "early magic morning day", which sounds in theory like a good idea (being allowed entry into the park an hour earlier than the other commoners), only EVERYONE has the magic early morning pass and not all of the Disneyland lands are open yet, so they funnel EVERYONE into Fantasyland, making is super-de-duper crowded. My poor hubby and countless other dads were stuck in a line just to get tickets for up to 40 minutes. Ug. Not a great way to start your morning. Once you get your return ticket, you can go about your day, then, close to your time, you come back, stand in a much shorter line of 15-20 minutes and you get to meet Queen Elsa and Princess Anna. By the way, Olaf is perched up on the rooftop and entertains people as you wait in line. Finally we were ushered into the Royal Reception room. As you wait for the family in front of you, you can check out the fancy snacks along the party table. Then magically, it was our turn! There were Elsa and Anna in all their glory. These girls were so in character as well. Queen Elsa was tall, strong, and proud. Little sister Anna was awkward and goofy. Again they took a couple of minutes to talk to the girls. They noticed all my girls had shirts with Elsa and Anna faces on them. They immediately asked where they could get shirts with MY girls' faces on them. This made them giggle. We had decided to see Elsa and Anna a second time because that was the day the girls were dressed up in princess costumes. 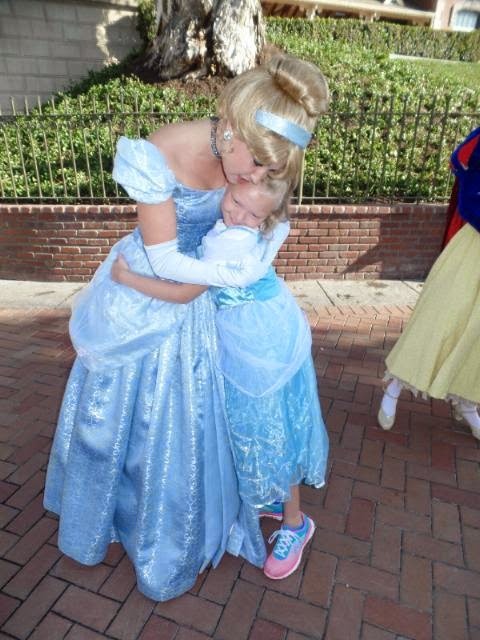 I had heard that girls will dress up in their favorite princess costume and wear them all day at Disneyland. (Thrifty trick #2, buy a costume before you come on clearance or after Halloween, and save a ton of money. The dresses in the park were PRICEY). We had packed ours (rolled up in a plastic bag to help keep sparkles off the rest of our clothes) just in case this was true. Sure enough, there were tons of princesses roaming throughout the park. We did not want to wear our dresses every day, but for one special day it was pretty awesome. 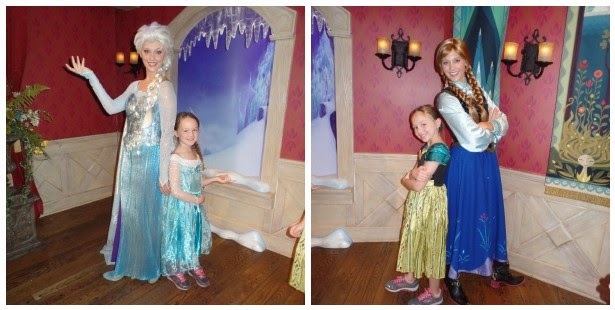 When we finally were ushered in to meet Elsa and Anna again it was a pretty special moment. Anna noticed right away my middle daughter had gone to some special lengths to recreate the "coronation hair do" with fancy braid. Here, my baby was dressed as Elsa, and my middle was Anna. When we finally did get to see them in the same costumes as their princess heroes, it was a great memory for my girls, not to mention a great Kodak moment for mommy. 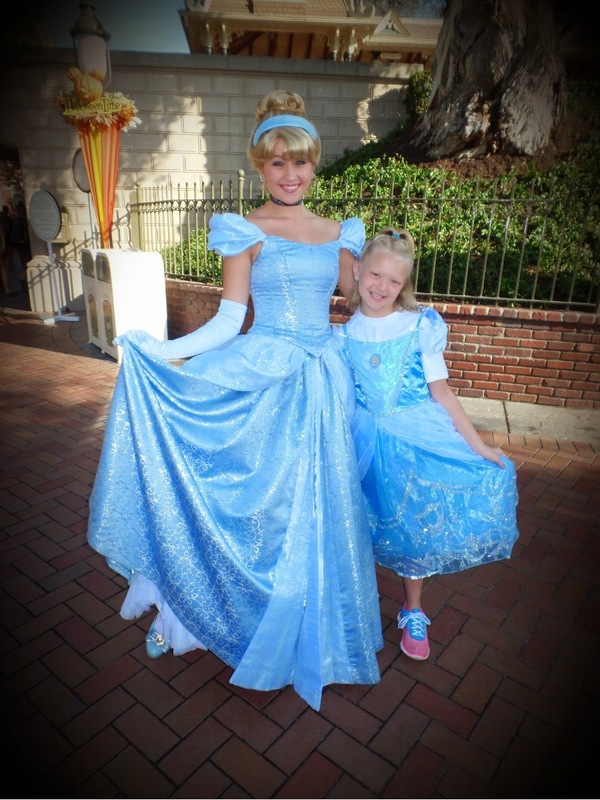 Thanks to us wearing costumes, there was another magical moment earlier in the day, when my oldest, dressed as Cinderella, ran into Cinderella near the opening of the park. I seriously got goosebumps when they hugged each other, it was so sweet! LOVE THIS!! Cherishing this one for always! So if you are going to be at the park for more than one day, I highly recommend letting your little princess dress like her favorite princess and see if you can't get a picture with them. Also, an added bonus is the cast members in the park will address them as "Queen Elsa" or "Cinderella" as they stand in cue for the rides, it's pretty cute. I am told that these five are the more challenging to find in the park. Aurora, can be a hit and miss at the Fantasy Faire at the Royal hall, and I've also seen her in other people's pictures near the entrance of Disneyland and near her castle over by Snow White's wishing well, though we did not see her at all during our visit. We actually saw Tiana walk by when were sitting in the Hungry Bear restaurant down by Critter Country (outside of Splash Mountain). She was exiting into the cast area and was not stopping for pictures, though I am told that she can sometimes be found in New Orleans Square near the train station in the mornings. I am told Jasmine (and Aladdin) can sometimes be found over at "Aladdin's Oasis" near the jungle cruise. There used to be a show you could watch and meet them after. I believe the show is closed down, though the oasis is still there. You would think Pocahontus would be located somewhere in Frontierland, or somewhere by the rivers of America, we definitely did not see her on our trip. Mulan, I have read on some pages no longer appears at Disneyland, while other people have claimed she comes out during Chinese New Year. I have also read that Mulan and Jasmine can be seen most often at the paid character breakfast at Goofy's Kitchen. 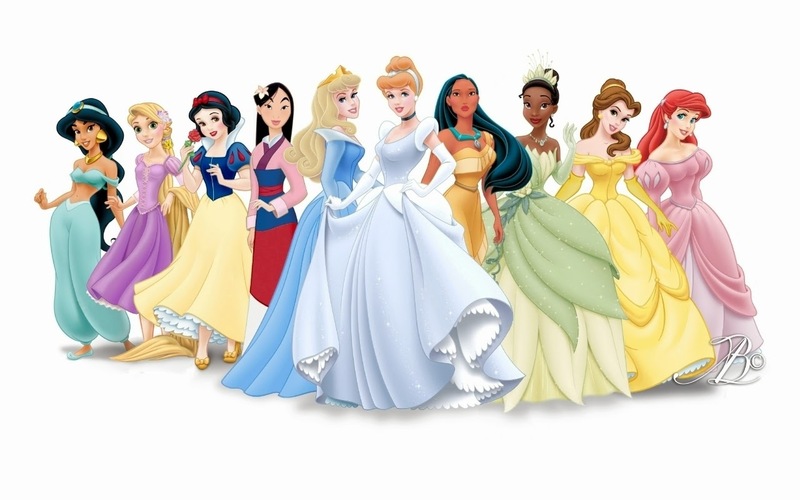 Most of these princesses CAN also be seen, in the Mickey's Sensational parade later in the afternoon (minus Pocahontus and Mulan), you just won't be able to snap a picture with them. When in doubt, ask a cast member (Disneyland employee) about certain characters you want to see. They might have some inside knowledge of the best place and times to find them that day. So this was our tips for finding the princesses! Obviously we are not regular season pass holders with a ton of insider knowledge, but with a little research before we went, we were able to meet and talk to some of our most favorite princesses, and get some pretty adorable pictures and memories made in the process. I will post soon on how to meet some of the other popular characters such as visiting the fairies of Pixie Hollow, and how to find the short fuzzy furry ones like piglet, Eeyore, Tigger, plus Mickey, Minnie and the whole gang. Stay tuned!